There are few jobs more courageous than becoming a teacher. Not only are the hours long and the pay not that great, but teachers also have to come up with their own inspiring lesson plans, schedules, and homework. This is all before even entering the classroom, and as any veteran teacher will tell you, it's best to expect the unexpected in that area. Teachers will encounter bullying, disrespect, frustration, joy, love, and triumph during their career. It's a job for which no college class can fully prepare anyone. Fortunately, there are hundreds of books written by real teachers that share real stories, tips, tricks, and motivation that will make the transition from college campus to primary or secondary school teacher that much easier. The following 50 books about teaching cover everything from lesson plans to teacher appreciation, and while certain books may be better suited for different grade levels, all are considered some of the finest in their particular area. 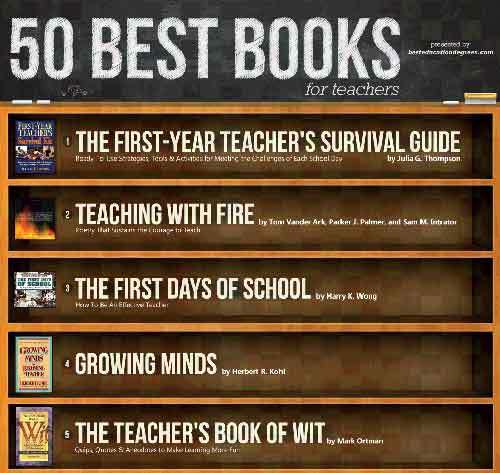 Click here for a summary of each book and in depth look at our 50 Best Books for Teachers.